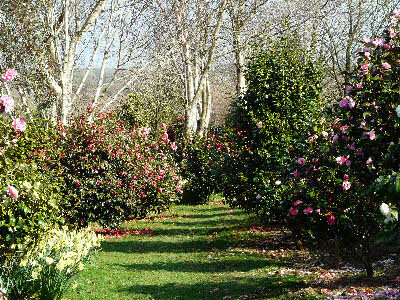 Marwood Hill Gardens is a very special private garden covering an area of 20 acres with three lakes set in a valley tucked away 4 miles north of Barnstaple. 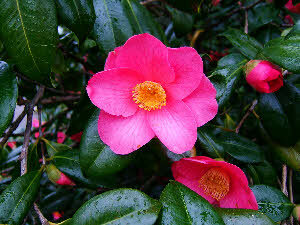 Created by Dr Jimmy Smart VMH in the late 1950’s and awarded the ‘ICS Camellia Gardens of Excellence Award in 2005’. The gardens are a wonderful haven in which to relax and enjoy the impressive collections of plants, shrubs and trees and experience the views, peaceful atmosphere and colour around every corner. The Walled Garden Plant Sales area is sure to tempt you with a variety of unusual plants for sale. Dogs on leads are welcome too. Dr Smart traveled to America in the 1960s principally to see the camellia gardens, nurseries and to visit gardening friends. During his travels he was given many cuttings of Camellias which he sent back to be propagated and this started the basis for his collection at Marwood. Further trips to America as well as to Australia and New Zealand followed, by which time the collection had increased significantly. He also received many cultivars from David Trehane, who was establishing his Camellia nursery in Dorset and through their friendship they exchanged and trialed many new Camellia species and cultivars. After his initial trip to America, a large greenhouse was erected in the walled garden and planted up with Camellias. This is still in use today and gives a spectacular display. Many of the Reticulata hybrids are grown in there such as, 'Mouchang', 'Mandalay Queen' and 'Lila Naff' and the spectacular deep double red , 'Harold Paige'. Several species such as, Camellia tsaii give a contrast in flower size as well as some lovely japonica cultivars like the two toned 'Spring Sonnet', the unusual 'Anzac' from Australia, the pure white elegant form of 'Snow Chan' and in the middle of the house is the spectacular sight of the flaming red, 'Fire Falls', a cultivar not often encountered but equally good outside. At the entrance are many mature plants welcoming visitors to the garden and here is where we grow the cultivar 'Jimmy Smart', a single red raised by Dr. Smart crossing 'Clarise Carleton' with the single pale pink 'My Darling'. Nearby is the lovely single white, 'Henry Turnbull' and also 'E.G.Waterhouse', a lovely silvery pink named after the former President of the Society and a regular visitor to the gardens from his native Australia.